We're good at what we do - we've been at it for a long time and because of our knowledge and experience we can give timely and relevant advice without the usual rigmarole. As we've been around a while, we know and have seen most situations, yet everyone's situation is that bit different and we relish the challenge of providing new solutions. We enjoy dealing one-to-one and developing "old style relationships" - we've done the bigger stuff in the bigger organisations and recognise what that feels like from your end. When you need to understand something, when you ask for something to be done or when you need specific advice, it happens. Why? Because we're small and responsive and we like being that way. When you phone, we listen without the meter running. We really want our business to be successful by helping you. Having collectively, over fifty years experience in the pensions industry, the Meritas principals, Tom Lyne and Therese O'Donohoe, offer expert insights and unique solutions that make a real difference to companies and individuals. 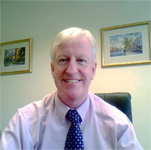 Tom is a Fellow of the Irish Institute of Pensions Manager, an Associate of the Irish Taxation Institute and holds a Diploma in Portfolio Management. Therese is a Qualified Financial Adviser and a Member of the Irish Institute of Pensions Managers.